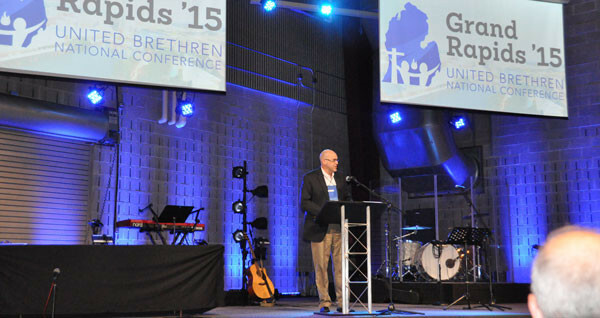 A few reports for the 2017 US National Conference are starting to appear on the United Brethren website. The Human Sexuality Task Force has finalized its proposals. Their white paper (report 22), which explains the proposals, has been posted on the Reports page, with links to download the report in PDF format or to view it online. A related PDF document (report 23) includes the entire “Family Standards” chapter of the Discipline, so you can see their proposals in the context of all of our other statements on family-related issues. If you are attending one of the upcoming Regional Meetings (which start May 15 in Michigan and May 17 in Willshire, Ohio), it is recommended that you download and read the report beforehand. It will be the central topic of the meeting. The Nominating Committee has finalized its report, with the nominations for both bishop and members of the Executive Leadership Team. The Discipline requires that the ballot for bishop be published 60 days prior to National Conference. The ballot for Executive Leadership Team members must be posted 30 days beforehand. From the Reports page, you can read their report online or download a PDF copy of it. 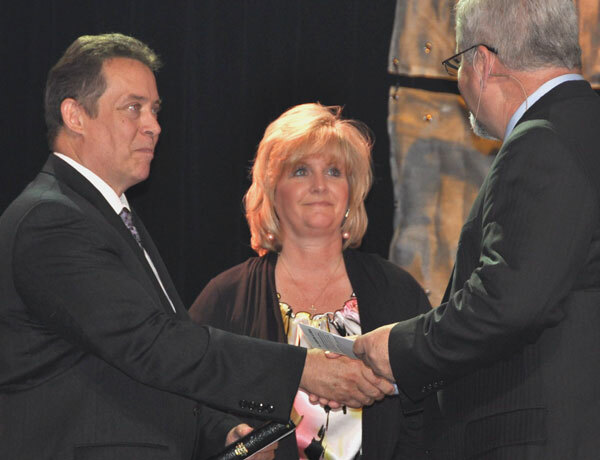 On July 16, 2015, the members of the 2015 US National Conference chose Todd Fetters as the next bishop–actually, “interim bishop,” since he would be completing the unexpired term of Bishop Phil Whipple. He would assume office on August 7, 2015. After the vote was taken, Todd Fetters made the following remarks (with slight editing) to the conference. Todd Fetters speaking to the delegates after being chosen as the next bishop. I’m not an alliterator when I do messages. I’m just not big on it. It’s a lot of work to come up with points that all have the same letter. And yet, I’m going to do it right here, right now. Let me just say, the events that you in executive session have heard and that we walked through—they are heart-breaking. I want to speak on behalf of the national office. It’s been a heart-rending, heart-challenging season for us. And yet, I think as you’ve looked at the national staff just in the last 24 hours, you’ve seen that they came to work, and they came to help, and they came to serve the church. I’m grateful for their ability to process challenging, difficult, heart-rending decisions and still come to do this, knowing that our calling is to Jesus Christ and to His Church, and to help all of us point in that direction of our Lord and Savior. So would you just thank our national office staff. We have had the opportunity to say it to Bishop Phil and to Sandy, that we love them and enjoyed working with them, and we have enjoyed working for our bishop. We will be continuing to pray for them, and we will continue to serve in the vein that he has led us to this point.So the first H is heart-breaking. Let me follow that up by saying I am humbled by this body’s confidence in me. I walk into the office every day and go down a long hallway on purpose. The hallway into the office from the back door is a whole long line of bishops’ pictures. Usually I’m troubled by the fact that most of them are cockeyed, and I sort of tilt them back into place. Whether that’s a message from the Lord or not, I don’t know. But as a kid growing up in the United Brethren church, and not far from headquarters, those are the people I knew as bishop. Those have always been individuals that I was taught to respect, and whom I learned to respect. I’m humbled to follow in that line for these two years. When I think in terms of our church, I think in terms of the modern era. One of the key parts of our modern era is when we went to one bishop, and that was Bishop Ray Seilhamer in 1993. He served us with a vision for two things—healthy churches, and church planting. A big part of that was endowing for church planting. So he got us in mind for healthy churches and planting churches. His illustration was a two-winged plane—which, by the way, is the only kind of plane I would want to fly. And then following Bishop Seilhamer was Bishop Paul Hirschy, who has given us leadership in transition to who we are. Between 2001 and 2005, we processed whether or not we wanted to be United Brethren, and we cinched it down. We are United Brethren. That’s who we are going to be. That’s what we want to be. So we said in 2005, this is who we are. At that national conference, we had a sea change in our structure, our organization. Ron Ramsey was handed the baton to make sense out of something we just sort of threw up in the air to some degree and said, “Make this work.” And we’ve been making this work. Then the baton was handed off to Bishop Phil Whipple. For the last six years, in a volatile culture when it comes to Christianity, he helped us cinch down what we are all about in upholding that one name once more—that we are All for Christ. That’s what we are about. Unashamedly, All for Christ. I look forward to keeping that theme, and the themes that got us to that point, as we move forward. So I’m heart-broken in the circumstances we are in. I’m humbled by your trust. And I’m hopeful that we will work together in collaboration for the great and glorious Gospel that is ours, given to us by Jesus Christ. Thank you, folks. It’s been my privilege to serve with our staff and with our bishop and with you. I look forward to what the Lord wants to do in the United Brethren church during the next two years. Todd Fetters leading the business session of the US National Conference on July 16, 2015. 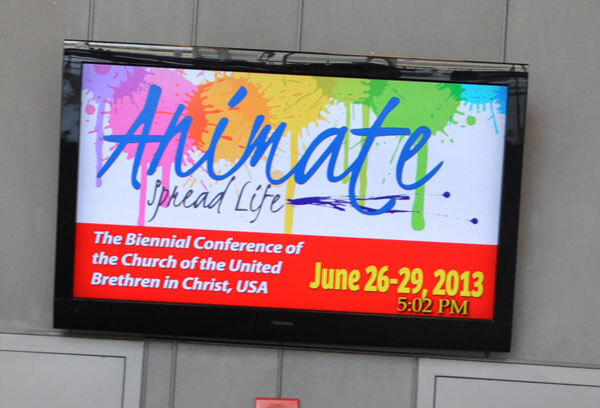 The business meeting of the US National Conference lasted throughout the morning and afternoon of Thursday, July 16. Several major proposals were on the docket. But the issue foremost in people’s hearts and minds was the resignation of Bishop Phil Whipple, which had occurred just one week before on July 8. What happened? And where would we go from here? This issue was scheduled early in the business meeting—in fact, the first item of business after the preliminaries. The end result was the appointment of a new bishop. The business session began with a hot breakfast for all delegates, sponsored by Logos Bible Software. There was some singing, then a brief presentation from Logos about the latest version of their software. Chairman: Todd Fetters, director of National Ministries. Assistant chairman: Bishop Emeritus Paul Hirschy. Recording secretary: Rocky Spear, pastor of Mongul UB church (Shippensburg, Pa.). 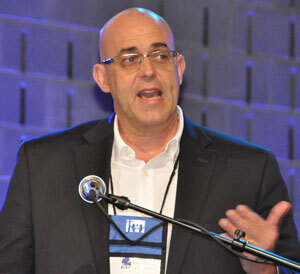 Parliamentarian: Craig Burkholder, pastor of Hudson UB church (Hudson, Ind.). Gary Dilley speaking on behalf of the Executive Leadership Team. After approving the Rules & Procedures to govern the meeting, Todd Fetters turned the chair over to Paul Hirschy to process approval of the Executive Leadership Team minutes from the past two years—four regular meetings, plus a variety of decisions handled through online voting. Jason Garwood, pastor of Colwood UB church (Caro, Mich.), asked if there would be some explanation of the resignation of Bishop Whipple. It was, indeed, the appropriate time for that. Two members of the 2013-2015 ELT came forward. Darwin Dunten, pastor of Findlay First UB (Findlay, Ohio), moved that the conference go into executive session, with only delegates and advisory members present. All other persons were asked to leave the room, and they did. Then Gary Dilley, pastor of College Park UB church (Huntington, Ind. ), read a letter on behalf of the ELT about the circumstances surrounding the bishop’s resignation. There were questions and responses. Nothing was recorded in the minutes. Bishop Hirschy closed the executive session at 10:30 with prayer. After a break, the delegates reconvened at 10:45. They quickly approved the work of the ELT. 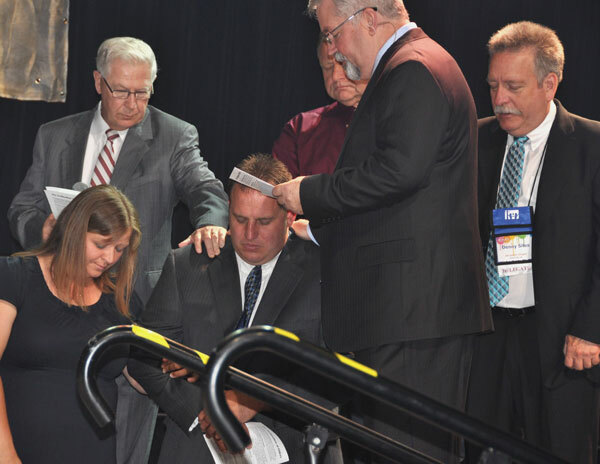 So, Todd Fetters would essentially serve the remainder of Bishop Whipple’s unexpired term, starting August 7 and continuing until a bishop was formally elected at the 2017 US National Conference. There was discussion about what title to use—“interim bishop,” or something else. The Discipline mentioned appointing an “acting bishop.” Jim Bolich, senior pastor of Prince Street UB church (Shippensburg, Pa.), made a motion to drop “interim” and just use “bishop.” A number of people voted for this amendment, but it lost on a much stronger voice vote. Dan Paternoster (layperson, Fowlerville, Mich.) said “interim” didn’t make the position smaller, but identified the position while reserving the term “bishop” for persons elected to that position. At 11:05, a vote was taken on Steve Fish’s motion, which remained in its original form after several attempted amendments. It passed with only one dissent. We had a new bishop. Eternal God and Father, we have come to a point in our national conference, in our denomination, that probably nobody has enjoyed. But we also thank you for your sovereignty in bringing to us the skills and capabilities to take care of the position, and to serve the church in a wonderful way. I thank you for Todd. I thank you for his life, I thank you for his witness, I thank you for his testimony, and most of all I thank you for the consistent way he has walked in the way of the Lord and the way of the Word. And I pray that as he assumes this new position, that those things will not change. Help him, Lord, to face the discouraging things without destroying him. Help him to accept the victories and wins without getting a big head. But Lord, I just pray you would be with him and strengthen and empower him for this awesome responsibility. Thank you for the years I’ve known him; I’ve known him to be honest and true and faithful. I pray that your Spirit would be upon him to continue moving him and directing him in that kind of fashion. In the strong name of Jesus I pray, amen. 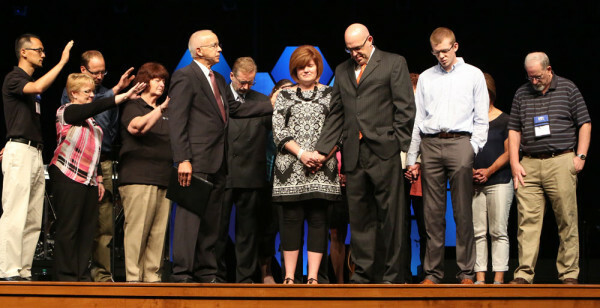 During the concluding service of National Conference on July 18, Bishop Paul Hirschy led a prayer of consecration for Todd and Lisa Fetters, family members, and the National Office staff. Registration is now open for the 2015 US National Conference. You can register online, or call the National Office. Complete information can be found at UB2015.org–schedule, lodging, area attractions, tracks for children and youth, and much more. You’re invited to join hundreds of United Brethren from churches across the country for this family-oriented conference. Meet your leaders, pastors, missionaries, and other dedicated laypersons. Get a better understanding of the broader church of which you’re a part. The attendance at national conference typically runs around 900–lots and lots of people from all over. A business meeting will be held Thursday morning. The US National Conference is our highest decision-making body. Each church can send at least 1 lay delegate, with more eligible depending on the church’s attendance. The United Brethren Discipline explains all of that. Basically, it’s one delegate for the first 150 attendance, and another delegate for each additional 100 people. 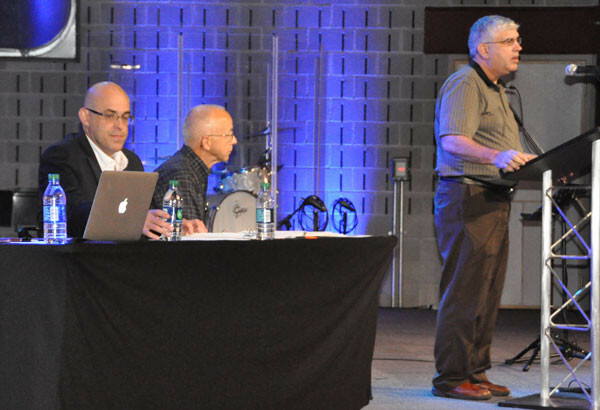 In addition, all actively-serving ordained, national conference, and specialized ministers have a vote. The conference will be held at ResLife Church, a very large church on the south side of Grand Rapids. Nine nearby hotels have given us a special conference rate. Numerous restaurants are located nearby, including one inside the church itself. There’s a huge two-level mall right across the street, and a Cabelas around the corner. Inspiring worship services. Workshops. Plenty of free time. Great music. Tracks for women, youth, and children. Worship. Learn. Laugh. Be inspired. And return home with great ideas for moving your church forward. “Each church shall have a Personnel Relations Team. Its primary responsibility is to cooperate with the stationing committee in securing a new senior pastor when the need arises. The local board will determine the constituency of the Personnel Relations Team. So, what’s that all about? Let me explain. A local board (the highest governing body). Lay delegates (needed only every two years for National Conference). Job descriptions for employed personnel. The pastor’s salary and benefits. Serve as a “conferring and counseling” committee to the pastor and other employed personnel. Cooperate with the stationing committee in securing a new pastor. Many churches prefer to divide some of those duties among different administrative entities—an elder board, finance committee, etc. Some larger churches employ a business manager or executive pastor who handles some of those issues. Is it really necessary to mandate this major administrative group, with these specific duties, for all churches? No. From a denominational standpoint, we need a Personnel team for just one situation—finding a new senior pastor. A local church group must work through that process alongside the bishop and cluster leader. It doesn’t need to be a permanent group. A Personnel team could be formed when a pastoral transition occurs, and then disbanded. All of those other responsibilities we heap on the Personnel team—that’s the church’s business. If the church wants to assign other responsibilities to a permanent Personnel team, they can. But it’s not necessary. Their choice. So, the new statement adopted by the National Conference follows our philosophy of giving churches freedom and flexibility. Technically, a local church doesn’t need to have a Personnel Team except when a pastoral change occurs. We don’t even state who, or how many people, should be on the Personnel team. Let the church decide. The National Conference approved the change without discussion. Passed right through. The US National Conference, meeting on June 27, eliminated the local conference, the highest governing body of each church. Which is probably news to you. I’m guessing you haven’t heard of such an entity being part of your church’s organizational structure. More to the point, even though “highest governing body” sounds important, axing it will probably not change anything about how your church operates. The local conference seems to have outlived its usefulness and was ready for the organizational scrapheap. And yet, the local conference has played an important role throughout UB history, so it’s worth explaining what exactly just went bye-bye. Plus the cluster leader (or conference superintendent in earlier times). Plus all persons in that church who hold a ministerial license. The bishop, superintendent, or cluster leader chaired local conferences. Before we did away with annual conferences in 2005, the conference superintendent typically met with each church’s local conference once a year (it was actually four times a year further back, if you can believe that; we called it the quarterly conference). Practices probably differed from conference to conference, but the way I saw it operate is: we would hold our regular board meeting, adjourn, and then the conference superintendent would convene the local conference with pretty much the same group of people. The local conference could grant and renew local church ministerial licenses, handle church trials and appeals, and disband a church. It was a step above the administrative board, which handled most church business. The local conference became somewhat superfluous in 2005 when we killed off the annual conferences. Plus, it didn’t fit very well into modern organizational structures. (The church’s highest governing body is chaired by somebody who isn’t even part of the church? Really?) Licensing now occurs throughout the year, and the regular local board can handle just fine all issues previously assigned to the local conference. We don’t need this uber group. Besides, the local conference as we’ve known it created a conflict in large churches with many licensed ministers on staff. Since all of those ministers are voting members of the local conference, they can potentially outnumber the laypersons on the board, making the pastoral staff the major “power” block. This also puts staff in a position of authority regarding the senior pastor, to whom they are accountable. Not a good situation, from an organizational standpoint. The National Conference readily agreed. They approved, without discussion, the proposal to discontinue the local conference. So now, the local board is the church’s highest governing body, period. No other local church group can trump their decisions. A “special meeting” is not a business meeting, but has a specific purpose—probably to deal with a problem of some kind. The local board is still the decision-making body of the church. A special meeting can be requested of the bishop, but not demanded just by putting in the request. As the wording states, the bishop will decide whether or not to actually call a special meeting. It may be that the bishop feels the problem can be better solved in other ways, so the proposal gives him that flexibility. For instance, if two persons are in conflict, maybe the bishop will opt to get together with the two of them and hash things out. No sense using a bazooka when a BB gun might do the trick. So, the local conference is gone, and we’ve cleaned up the local church organizational structure. But churches still have an avenue for requesting the bishop’s intervention. Victor Collins and wife Susan with Bishop Whipple. 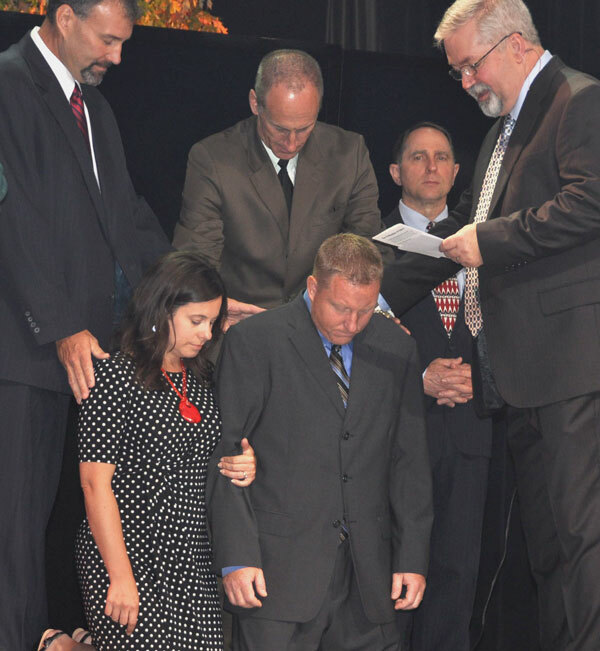 Bishop Whipple conducts the ordination of Jason Holliday (kneeling with wife Christy). Todd and Julie Rupp with Bishop Whipple. Todd and Amy Yoder kneel as Bishop Whipple conducts the ordination ceremony. During the closing service of National Conference on Saturday, June 29, Bishop Phil Whipple ordained four men as elders in the Church of the United Brethren in Christ, USA. All four serve in staff positions at United Brethren churches. Victor Collins is associate pastor of Kilpatrick UB church in Woodland, Mich. He has served in that role since 2004. He holds a bachelor’s degree in Bible and Theology from Vennard College in Iowa (1994), and earned the Master of Divinity in 1998 from Asbury Seminary. He received his national conference ministerial license in 2005. He and his wife, Susan, were married in 1983 and have three children. Todd Yoder is associate pastor of Jerusalem Chapel in Churchville, Va. He served four years as youth pastor of Monroe UB church in Monroe, Ind., before going to Jerusalem Chapel as youth pastor in 2003. Todd graduated from Taylor University (Upland, Ind.) in 2001 with a degree in Pastoral Ministry. Todd’s wife, Amy, is from Monroe and graduated from nearby Ball State University in 1994 with a degree in Accounting. They were married in 2002 and have four children. Jason Holliday is Pastor of Family Ministries at Emmanuel Community Church in Fort Wayne, Ind. He graduated from Huntington University in 1996 with a degree in Educational Ministries, and in 2012 received the Master of Ministries degree from Bethel College (Mishawaka, Ind.). 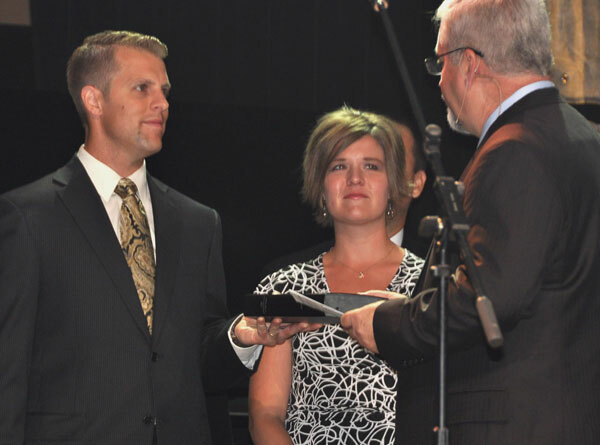 Jason spent four years serving at a United Methodist church in Markle, Ind. (1999-2004), and joined the Emmanuel staff in 2004. Jason received a Specialized Ministry license in 2005. Jason and his wife Christy, who holds a Math degree from Huntington University, were married in 1999 and have two children. Todd Rupp is Pastor of Youth Equipping Ministries at Emmanuel Community Church in Fort Wayne, Ind. He has served on staff there since 2004, when he came as an intern. Todd received the Specialized Ministry license in 2005. He graduated from Huntington University in 2005 with a degree in Physical Education, and received a Masters in Ministry degree from Bethel College (Mishawaka, Ind.) in 2010. Todd and his wife, Julie (a 2005 Music Education graduate from HU), were married in 2004 and have two children. Hold a national conference ministerial license for at least two years. Complete the course of study outlined in the Pastoral Ministry Handbook. Serve for two years in a recognized ministry appointment approved by the Pastoral Ministry Leadership Team. Demonstrate a level of faithfulness and competency which warrants consideration for the status of ordained elder. 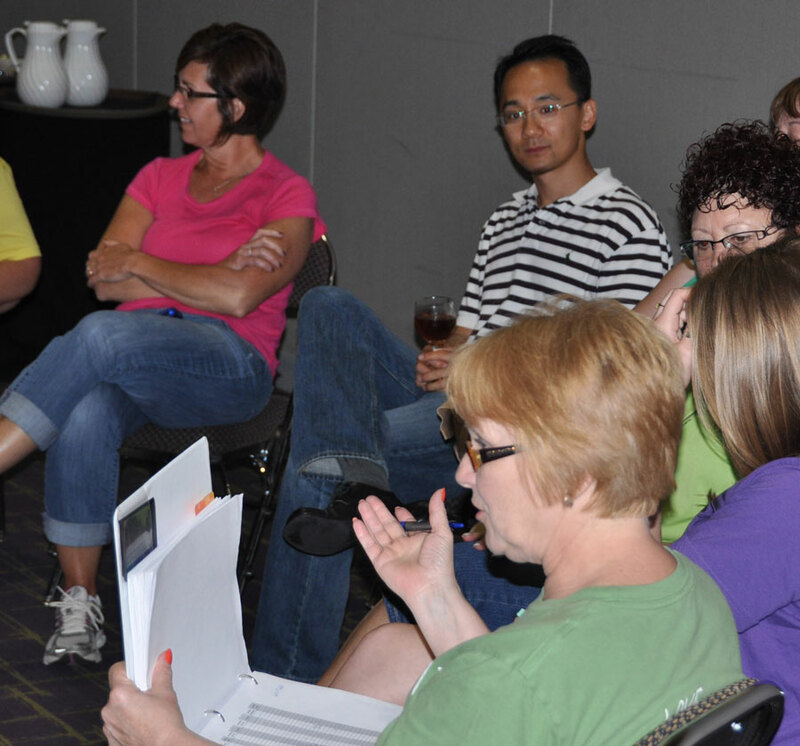 Nearly 500 photos from the 2013 US National Conference have been posted on Facebook. They are on the United Brethren Facebook page. You don’t need a Facebook account to view them–they are available for public viewing. They are divided into separate albums chronologically. Tuesday, June 25 – Setup day. 39 photos. Wednesday morning and afternoon, June 26 – Setup continues. 74 photos. Wednesday evening, June 26 – Opening service, Global Ministries reception. 69 photos. Thursday morning and afternoon, June 27 – Breakfast, business session, women’s track. 86 photos. Thursday evening, June 27 – Evening service, Networking Reception. 33 photos. Friday morning, June 28 – Workshops. 40 photos. Friday afternoon and evening, June 28 – Touring Huntington University, Todd Agnew concert. 45 photos. Saturday morning, June 29 – Closing service, ordination service. 80 photos. This is what’s showing on monitors throughout the Grand Wayne convention center. 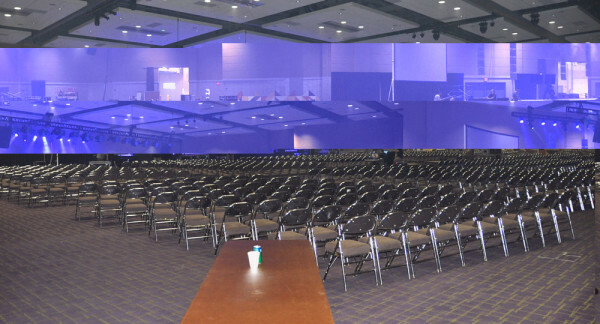 The main ballroom, where services will be held. About 1150 chairs are set up. Cathy Reich (foreground) getting all the workers on the same page. Bishop Phil Whipple (right) and Frank Y unload the Huntington University trailer. Todd Fetters and Jane Seely on the goody bag assembly line. Tuesday was set-up day for the 2013 US National Conference. A crew from Emmanuel Community Church spent much of the day getting the main ballroom ready for the evening worship services, which begin at 6:30 pm on Wednesday, June 26. Meanwhile, most of the national office staff, along with a few spouses and other volunteers, worked on filling goody bags and registration packets, and various other things . The workers ate an evening meal together, and then had a short pow-wow during which Cathy Reich, administrative assistant to Bishop Phil Whipple and the true brains behind the conference, talked through a number of issues to get everybody on the same page. Set-up will continue on Wednesday morning. Then registration starts at noon, with people will be arriving all afternoon. It’ll be a grand day! Photo galleries will be posted on the United Brethren Facebook page. Here’s the first one–38 photos from Tuesday.